Q1. Why has the indicator solution and agar mix turned yellow? A1. There are two possible reasons, 1) the agar was too hot when added to the indicator solution, or 2) the mixture has been overheated (i.e. above 65°C). Discard this mixture and start again. Q2. Why are the colorimetric detection plates yellow before beginning the experiment? A2. The plates have been exposed to CO2 during storage. They must be stored in a CO2-free environment. This can be achieved by using a sealed box or dessicator containing self-indicating soda lime (and a separate container of water to minimise drying of the plates) and replacing soda lime frequently. Using self-indicating soda lime gives the best indication of when the soda lime requires replacing. Do not use plates if they are not of uniform colour or if the agar has started to dry out. Q3. The wells at the edge of the plates have reacted differently to the wells in the centre. Why is this? A3. Most microplate methods have edge effects but we have found these to be fairly minimal. To overcome this or minimise the effects, you could randomise your block design but if you get very large variation which has nothing to do with the seal, it is likely to be due to unequal heat distribution across the plate. 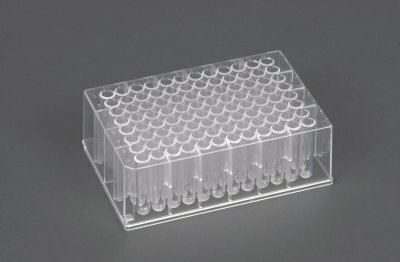 There are incubators on the market that are specific for incubating microplates with very good air circulation, and have a large area available so plates are not stacked. It is good practice to check temperature control and variation in your incubator and as a compromise try not stacking too many plates together (e.g. < 3). Q4. The soil samples are quite wet, and will not go into the filling device easily. How do I overcome this? A4. Ideally for filling, the soil needs to be at around 40% of it’s maximum water holding capacity. The best way to dry your soil is to spread it out evenly on a tray and leave it at room temperature to slowly loose water. You will need to mix it regularly to ensure the drying process if fairly even. Also, you have to prevent the soil particles from drying out completely so do not leave them for long periods of time unchecked. If any soil particles do dry out, remove them from the sample. After treatment the soil should be sieved through a 2 mm stainless steel sieve. Please note that some samples that are hydrophobic on drying (e.g. peat) are best weighed directly into the plate.